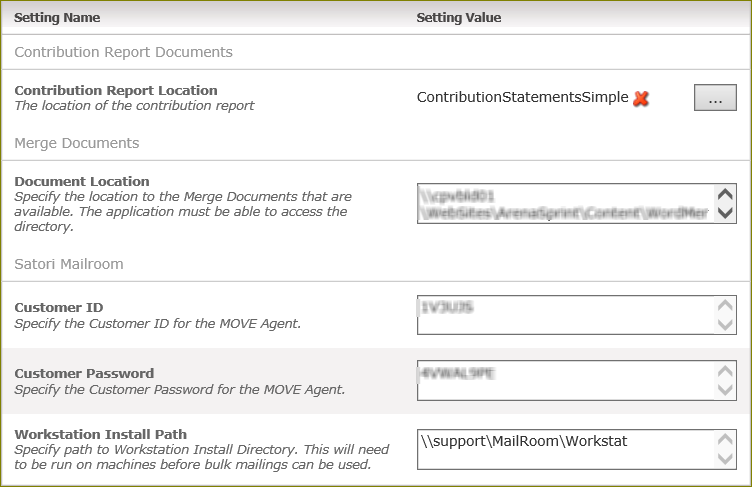 If your organization currently has a Mailroom subscription, users can continue to use the features available in Mailroom from the Membership menu and Mailing option once you configure the current account on this page. Now let’s discuss loading Mailroom on the server, as opposed to each workstation. For self-hosted clients, you can install Mailroom on the server. If Shelby v.5 and Arena are not using the same server but are on the same network, enter the file path in the Workstation Install Path application setting. It is recommended that you install MailRoom on your Arena SQL server, however if you are still using it in Shelby v.5 you need to keep it on the Shelby v.5 server. •Contribution Report Location – This is the contribution statement report for contribution statements. •Document Location – This is the file path for word merge documents. It should be a shared UNC path in order for the workstations to see the folder. •Customer ID – This is your Shelby Mailroom customer ID. •Customer Password – This is your Shelby Mailroom password. •Workstation Install Path – This is the file path to Mailroom. The workstation install path is typically C:\MailRoom\Workstat. Install differs if MailRoom is installed on a different drive or in a different location other than on the root of the C drive.